An investigation is underway after a Texas mosque was devastated by a fire on Saturday. With the cause of the blaze still unknown, authorities in Victoria are appealing to the public to not draw hasty conclusions. 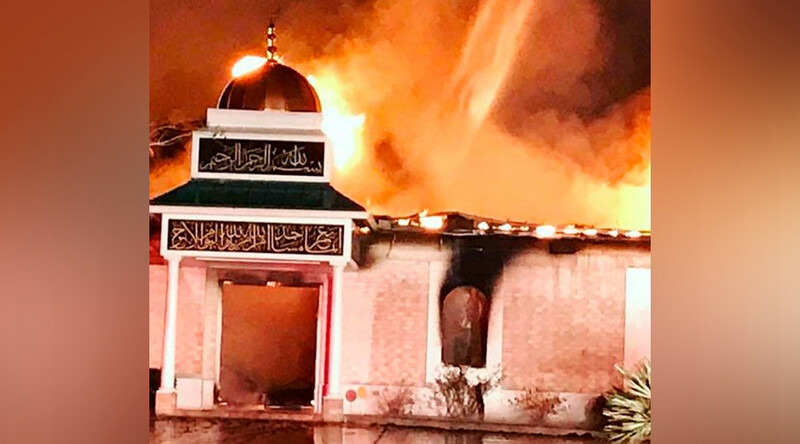 The Islamic Center of Victoria was reported to be on fire at around 2 am and was engulfed in flames when emergency services attended the scene, according to the Victoria Advocate. Firefighters battled the intense flames for four hours before managing to extinguish the flames. No injuries were reported. The cause of the fire is not yet known, but the Victoria Fire Marshal's Office has launched an investigation assisted by the State Fire Marshal's Office and Bureau of Alcohol, Tobacco, Firearms and Explosives. Victoria Fire Department Chief Taner Drake asked the public not to jump to any conclusions about the cause of the fire. The President of the Islamic Center, Shahid Hashmi, told the Victoria Advocate he would not speculate on whether the fire was an arson attack but said the center had been burgled last week. A number of electronic devices were reported stolen in that incident. The Islamic center was previously vandalised in 2013 when a man spray painted “H8”, the short form for hate, on the front of the building. The center expressed its gratitude to the community. Posting on Facebook, it thanked those for their support and asked for the tragedy not to be politicised. A public prayer service was held on the grass area of the center Saturday morning as the local community came to terms with the destruction of the mosque. A GoFundMe page has been set up to rebuild the place of worship, home to some 100 worshippers, and has already raised more than 100,000 of its $450,000 target.